Easter is coming up fast and everyone I meet is starting to think about gifts and cards. 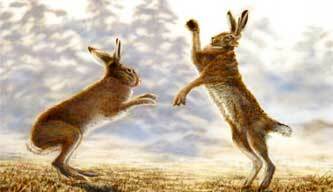 While chocolate easter eggs and bunnies is very popular, there is a wildlife aspect to this time of year with hares boxing. I have this painting I did many years ago printed on to gift items such as cushions mugs and coasters which can been seen under the gift item names on www.richardalbon.co.uk. In addition to the painting there are other animal artwork images done in pencil or watercolour to choose from.